The snakeskin print is HOT for Spring/Summer 2011, but this isn’t your grandma’s snakeskin. Designers have updated its look for the warmer months and made it much more youth- (and yet still not PETA) friendly. 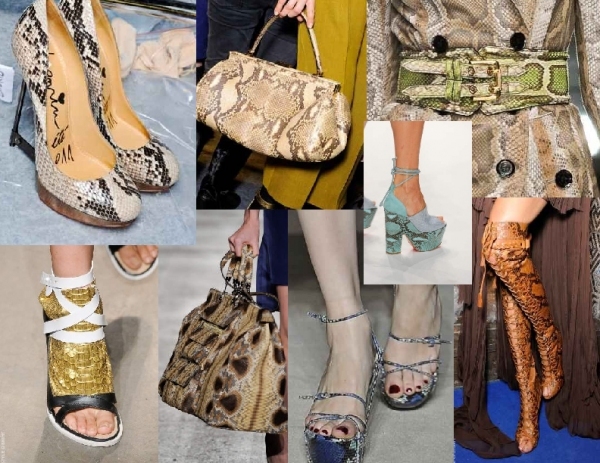 Just check out this collage pic from The Sche Report’s blog about the popularity of “Predator Prints” at Spring/Summer 2011 fashion shows internationally. The snakeskin trend even crossed over into the nail art realm. In this post from Allure.com, they found a nail salon that is actually offering customers a pedicure that uses real snakeskin…for $300! I don’t know about you guys but I’d like to spend just a little a whole lot less on my manicure/pedicure needs, especially if it’s just to follow a trend. So I came up with a way of mimicking the snakeskin print on nails using 2 different nail colors and a small piece of tulle from Jo Ann Fabrics. I applied my base coat then two coats of China Glaze Oxygen (very pale pink) and let that dry for a bit. I then applied 1 coat of China Glaze Liquid Leather (black) and while it was still wet, I made an imprint with the tulle on my nail then quickly peeled it off. Add 1 coat of top coat and Voila! Disclaimer: For any PETA people out there reading this – I love snakeskin, sorry. That said, to those who are ready to jump on the snakeskin trend bandwagon, I’d recommend checking out your local vintage and thrift stores before buying a brand new snakeskin bag, shoe, or belt. Not only will you save money but it’s a great way to reuse the fashionable pieces already out there. Style is cyclical. Grab some trendy pieces from yesteryear. Let me know what you think! Don’t be scared, that’s what the comment section is for :-D! 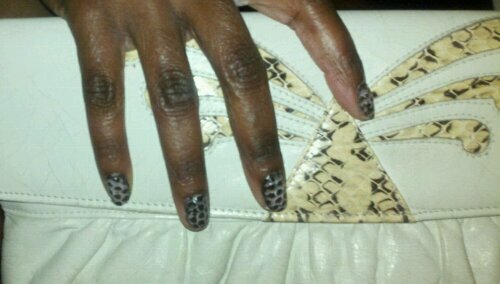 Posted on April 15, 2011, in Animal Print, Luxe Nails, Trend Watch and tagged China Glaze, China Glaze Liquid Leather, China Glaze Oxygen, manicure, nail art, nail polish, pedicure, snakeskin, spring fashion. Bookmark the permalink. 1 Comment.